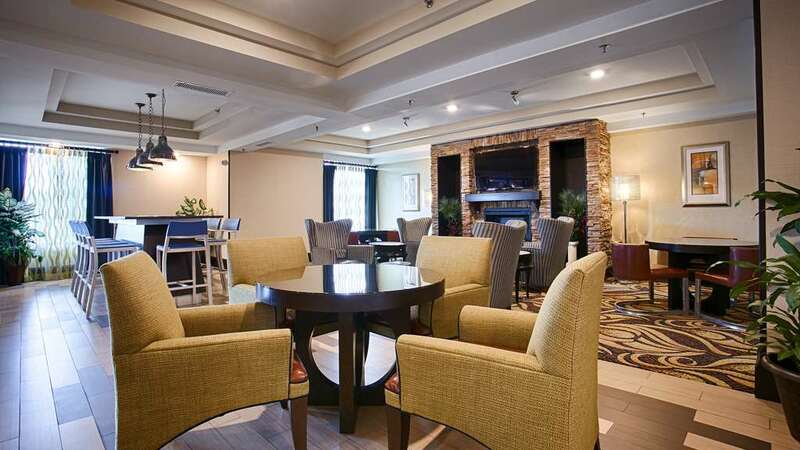 Designed with the needs of our business and leisure travelers in mind, our affordable hotel in Columbia, SC, is the perfect destination for your trip to USC and the historic areas of Columbia. The Best Western Plus Columbia North East is your home away from home, a modern property with amenities that will make your trip that much more memorable. Enjoy the convenience of a refrigerator and microwave in your guest room, access to a fitness center and business center amenities, available 24 hours a day. All of our guests enjoy a complimentary full breakfast each morning featuring a choice of breads, eggs, meat and other hot items. Youll also find some great places to eat across the street and within a short drive of the hotel. A guest laundry care center and a Suite Shop stocked with snacks and other convenience foods make life a little easier when youre on the road. Whether youre planning on spending the day exploring downtown Columbia or are heading to work in the Northeast and Blythewood Business Districts, our hotel puts you within easy reach of several key sites and attractions. Youll be minutes from area corporate offices and the Columbia Metropolitan Airport is only 19 miles away. We are easily accessible from I-20 and I-77 within a short drive of Sesquicentennial State Park. Modern conveniences, an easily accessible location and several free amenities and services make the Best Western Plus Columbia North East an attractive destination for all types of travelers. Book through bestwestern. com and to get the lowest available rates with our Low Rate Guarantee. Lizard's Thicket: Across the street from Lizard's Thicket, full service, American, open for: breakfast, lunch, dinner, provides a country cooking menu.